Dr. Mads Gilbert, a Norwegian doctor, joins us from Gaza where he has been treating hundreds of victims wounded in Israel’s ongoing assault, including young children. Dr. Gilbert says hospitals are operating without electricity, water and proper medical supplies, but adds: "As a medical doctor, my appeal is don’t send bandages, don’t send syringes, don’t send medical teams. 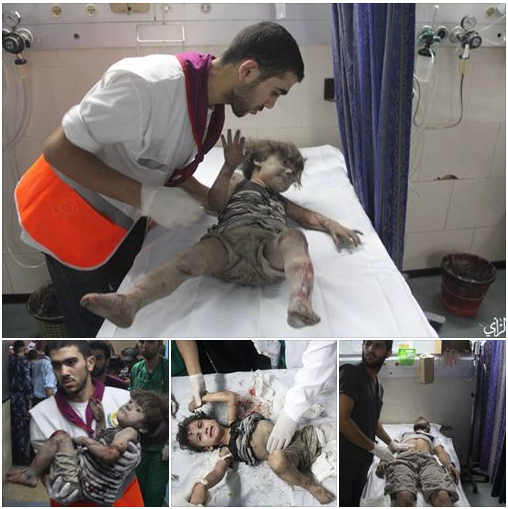 The most important medical thing you can do now is to force Israel to stop the bombing and lift the siege of Gaza." Gilbert recently recently submitted a report to the United Nations on the state of the Gaza health sector in 2014. "Where is the decency in the U.S. government allowing Israel this impunity to punish the whole civilian population in Gaza?" Gilbert asks. AMY GOODMAN: Dr. Mona El-Farra, we’re also joined by Dr. Mads Gilbert, the Norwegian doctor who has just come back to Gaza, who submitted a report to the United Nations on the state of health in Gaza. Dr. Gilbert, I know you have a long line of patients there, but—and we had hoped to have you all on a satellite connection, but it’s very difficult with the electricity going out constantly. You rarely in the media see direct reports from Gaza in the same way that you do from Jerusalem, from other parts of Israel. Dr. Mads Gilbert, what are you seeing right now? determination and the way they cope with these extremely harsh conditions that they’re in now. As you said, so far, close to 170 Palestinians have been killed, among them 36 children and 24 women. And among the 1,232 injured, there are 346 children and 256 women. So, 50 percent of the injured are women and children. 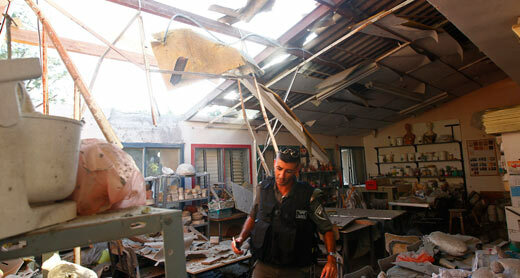 Now, this tells you that these attacks are not targeting the militarists in Palestine, in Gaza. These attacks are targeting the whole population in order to intimidate them and to force them to give up their resistance. I’ve been to Gaza through the last 17 years, and every time it is the same story. Israelis are accusing the Palestinians of attacking them; they have to defend themselves, they claim. Actually, the truth is the exact opposite. Israel is the attacker, the occupant. Internationally, they are responsible, according to the law, for the security and the well-being of the occupied population, whereas in fact Israel is doing their utmost to kill them and to make their life as miserable as possible through these seven years of siege. And I would like to add that I work in a Norwegian university hospital, and we are depending on the same sort of preconditions to handle mass casualty situations. The Palestinian hospitals are denied a constant supply of energy, of water, of disposables, medical drugs—all the items you need to run a university-level hospital. And on top of this, on top of this total drainage of resources from the siege, they are now exposed to this constant and very large flow of very severely injured. And they are not crippled. On the contrary, they stand tall. They have doubled or tripled their shifts. They do 24-hour shifts. Everyone is extremely tired and exhausted, but they don’t yield. They don’t leave their positions. And yesterday, the hospital director in Shifa, Dr. Nasr’s home was completely bombed and destroyed by the Israeli forces. And we have, of course, nurses and doctors and other ambulance drivers being injured and even killed. So, I think it’s important to understand that the Palestinians, yes, they are suffering, but they are not begging. Yes, they are oppressed, but they are standing extremely strong together in this time of crisis. As a medical doctor, you know, my appeal is: Don’t send bandages. Don’t send syringes. Don’t send medical teams. The most important medical thing you can do now is to force Israel to stop the bombing, and it is to lift the siege of Gaza. Then the Palestinians will manage well themselves. As for the injuries, there are all types of war injuries, from shrapnel injuries to these very extreme damages from the DIME weapons, the DIME explosives, the dense inert metal explosives, that they are using, carried by Hellfire rockets connected to the drones of Israeli, and they are extremely destructive. So people are torn apart. I mean, they’re split at their midlevel. They lose their arms and legs, and they’re killed. They’re charcoaled by the burns, if they are hit by these DIME explosives. We have had gruesome, absolutely gruesome injuries, which people cannot actually watch. But the most important injuries are those who maim without killing. I was just tending to a 24-year-old Palestinian student who has lost both his legs at hip level. We had to amputate both his legs. Both arms severely burned, now he has septicemia. And it’s really a hard struggle, even for a well-equipped American university hospital with all supplies and peace and security, to handle one such patient. Now they have by the hundreds. The other patient I tended to was a five-year-old. His house was bombed. The roof of the ceiling of his bedroom fell on his head. He has a closed head injury, very severe. We don’t know if he will survive. What did these people do to deserve this treatment? What did these people do to deserve the support of the U.S. government to support Israel to attack the people of Gaza in this way? I mean, where is the humanity? Where is the decency of the U.S. government allowing Israel this impunity to punish the whole civilian population in Gaza? It’s just outrageous. And the main problem in the Middle East today, it is the Israeli impunity. They go on with these so-called military campaigns every third year. They kill. They maim. They try to sort of oppress the population to surrender. The Palestinians will never surrender. And our duty is to support them and to raise the awareness and to raise the solidarity work in our countries to pressure our politicians to change the attitude towards the real oppressor and the real criminal here. It is the state of Israel. AMY GOODMAN: Dr. Mads Gilbert, the attack on the center for the disabled where two women were killed, can you talk more about that? Do you know of that? DR. MADS GILBERT: Yes, of course I know about that. This is a well-established hospital, which is doing, you know, rehabilitation work for disabled, not at least the war injured. This hospital is located in an area which the Israeli military obviously wants to flatten in order to have more easy access for their tanks. I was not there, but the reports I had were that they actually had soldiers come in fairly close to the hospital, and then they targeted it, and killing these people, as you say. In 2009, there was absolutely no security for hospitals and ambulances, nor was it in 2012. So, I mean, if there is one nation firmly supported by the U.S. which is violating the Geneva Convention, violating the international treaties in all aspects, it is Israel. They don’t even respect hospitals. And why don’t they open corridors so that the hospitals in Gaza can have supplies? Why don’t they open Erez and Rafah, the Egyptians also, to evacuate those severely injured that need to be treated abroad? I mean, even those very, very basic provisions, which are anchored in international law, is denied the Palestinians. AMY GOODMAN: Well, I want to thank you both for being with us. Dr. Mads Gilbert, a Norwegian doctor providing medical assistance in Gaza, he has just returned there and submitted a report to the United Nations on the state of Gaza’s health sector, submitted to the U.N. Refugee and Works Agency. Dr. Mona El-Farra, Gaza projects for the Middle East Children’s Alliance, also with the Palestinian Red Crescent Society of the Gaza Strip. I know you have a lot of work to do. Thank you for taking the time to speak to us. 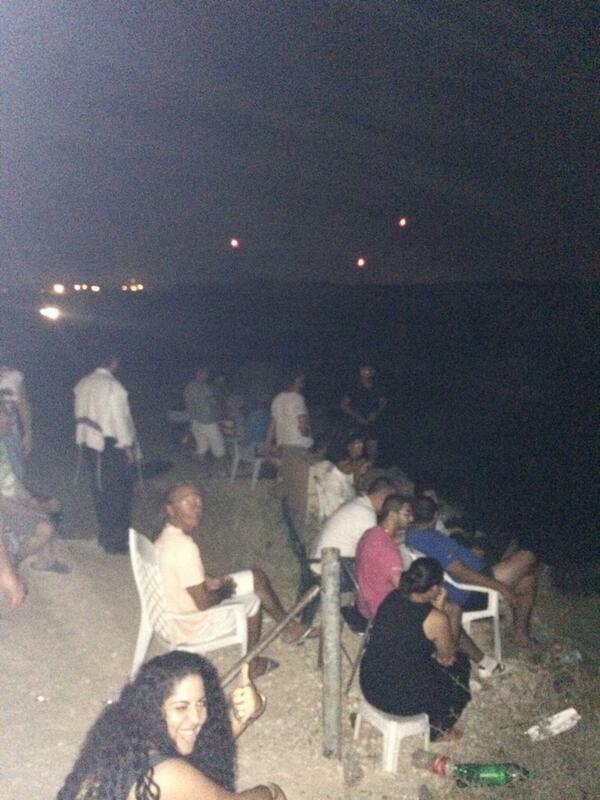 Israelis gathered on a hilltop outside the town of Sderot on Monday to watch the bombardment of Gaza. Allan Sørensen @allansorensen72 Sderot cinema. 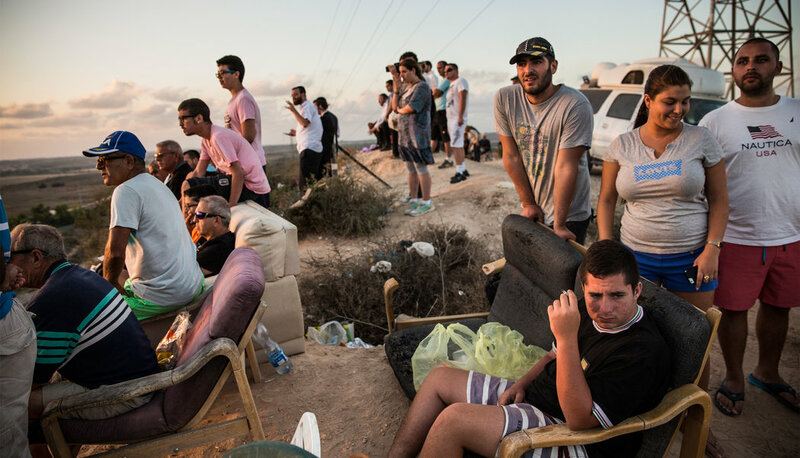 Israelis bringing chairs 2 hilltop in sderot 2 watch latest from Gaza. Clapping when blasts are heard. The image of the Israeli spectators was taken after 9 p.m. local time on Wednesday night, the reporter said, which was about the same time that what was intended to be a “precision strike,” from Israel’s military killed at least eight of their Palestinian neighbors, seated in similar plastic chairs at a beachside cafe in Gaza, waiting to watch the World Cup semifinal between Argentina and the Netherlands. As his image reverberated around the social network, where it was shared more than 10,000 times, the reporter was surprised by the response. It was, he said in a telephone interview from Israel, “nothing new.” Similar scenes, of Israeli spectators gathered on the high ground above Gaza to view the destruction below, were documented in a Times of London article and a video report from Denmark’s TV2 during Operation Cast Lead in 2009. 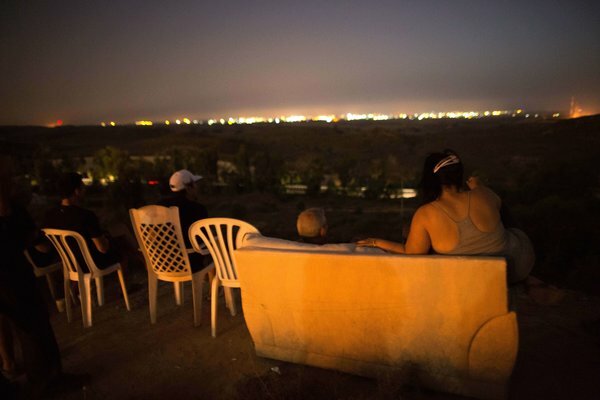 Israelis watched the bombing of Gaza on Saturday night from a couch dragged to a hill overlooking the Palestinian territory. 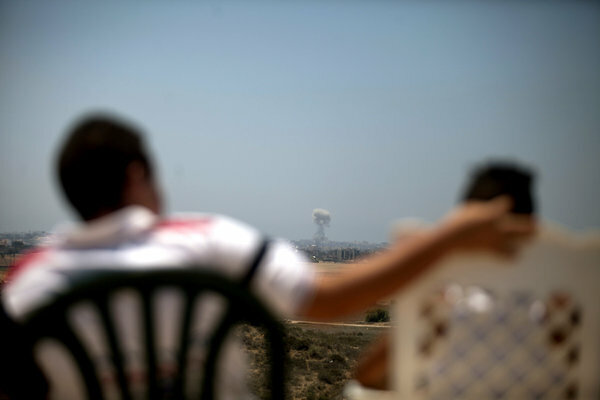 Despite the willingness of some residents to stand in the open watching the war unfold, Sderot is well within range of rockets launched by Islamist militants in Gaza and has been hit in recent days. When he was a candidate for the American presidency in 2008, then-Senator Barack Obama visited the town and saluted “the brave citizens” of Sderot while standing in front of a collection of spent rockets that had been fired at them from Gaza. He was also presented with an “I Love Sderot” T-shirt that channeled the dark humor of the residents, with the image of a heart on its front pierced by a rocket. Mr. Sørensen, who stressed that he has “a complete understanding of what the people of Sderot have been going through for 14 years,” attributed the particularly vitriolic response to his Twitter report to the climate in Israel since three young religious students were kidnapped and murdered in the occupied West Bank last month. The journalist called the “extreme incitement to violence from very right-wing Israeli groups unprecedented” in the many years he has been reporting from the region. 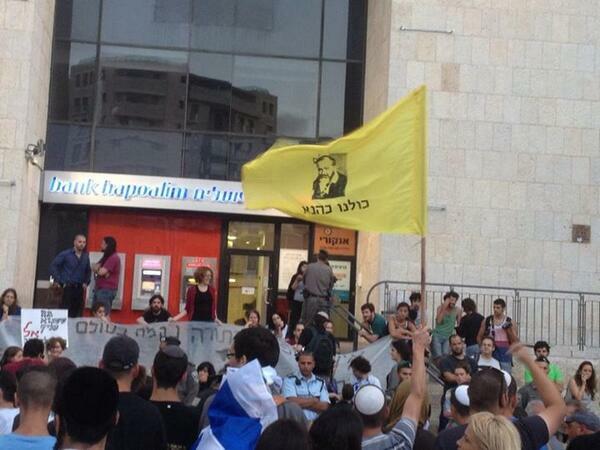 David Sheen @davidsheen RIGHT NOW: Jewish fascists rally in downtown Jerusalem, chanting "Death to Arabs! ", "Traitors!" & "Leftists to Gaza!" The Israeli blogger David Sheen reported that a far-right rally in Jerusalem on Monday was marked by calls to kill Arabs and send Jews opposed to the bombardment to Gaza. 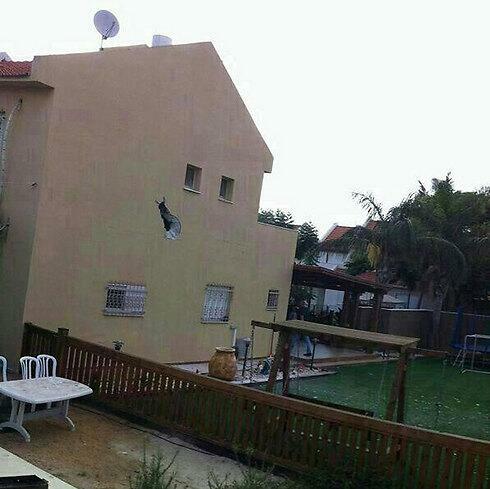 Building hit by rocket, southern Israel. According to IDF Spokesperson figures published in the media, since the beginning of Operation Protective Shield, Hamas and other armed Palestinian groups have launched over 800 rockets and mortar shells into Israeli territory. Figures released by Israeli medical emergency services provider Magen David Adom indicate that during the first six days of the operation, 13 Israelis were injured by shrapnel, debris from buildings that had been hit, or fires that were the result of rocket landings. According to estimates, without Israel’s advanced air defense system, the number of casualties and the scope of the damage would have been greater. 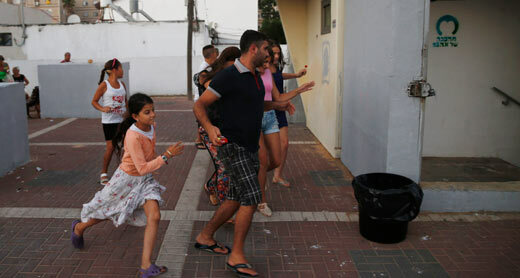 Ashkelon residents run for shelter during a siren. Millions of Israeli citizens, many of whom are children, have been living under the threat of rocket fire for almost a week. For hundreds of thousands of Israelis living in the south of the country, this terrible situation is part of an ongoing routine. The unrelenting attacks have disrupted their lives, denied their right to live in security and hurt their ability to make a living. Every venture outside – to work, school, or a recreational activity – is attended by a sense of danger. Some residents have even decided to relocate for fear they or their loved ones would get hurt. The deliberate targeting of civilians by Hamas and other Palestinian armed groups is an act that defies humanity and is morally and legally reprehensible. The war is now in its seventh day, the death toll is rising briskly, 17,000 people have fled Beit Lahia in the north after the threat of a land invasion, fishermen are prevented from accessing their fishing grounds, and sewer and water pipes for 70,000 people have been bombed. It is no longer a question that the Israeli military is targeting civilians, and civilian infrastructure. On the way to my shift to provide protective presence at al-Wafa hospital in the northeast, we stop at one of the many residential buildings that have been bombed, this one last night. We see the devastation, with floors hanging vertically down, cars overturned by the blast, shattered windows on the street, and people, Palestinian civilians, trying to find belongings that might be salvageable. The hospitals, which are already suffering from chronic shortages of medicines and essential medical supplies, are forced to prioritize patients. I have witnessed hospital staff forced to place two bodies on the same stretcher since it was full in the cold storage. I have seen dismembered and burnt people after a drone attack. It is a war against civilians. It is a war against the political unity between Gaza and the West Bank, including East Jerusalem. It is a war against striving towards a Palestinian state. It is a war for continuing occupation and colonization. It is a war against, not for, peace. Netanyahu's wife says to him: "Bibi don't stop the fire"
Efforts toward a ceasefire between Israel and Hamas are underway, but no deal has been reached yet, an official from the Islamist movement said Monday. "There are efforts and communications on the issue of a truce deal but until now there is nothing final," he said, after Egypt proposed a truce to begin 9 a.m. Tuesday. The official confirmed Egypt was mediating discussions of a ceasefire to end seven days of violence that has killed at least 184 Palestinians and seen hundreds of rockets fired into Israel. Egypt late Monday proposed a truce that would begin on Tuesday morning, when US Secretary of State John Kerry is scheduled to arrive in Cairo, according to Egyptian media, to push for an end to hostilities. "0600 GMT (9 a.m. Jerusalem time) has been set for the beginning of the implementation of truce arrangements between the two sides," the text of the Egyptian proposal said. The ceasefire would be followed by talks on easing the flow of goods into Gaza, which has been subject to an Israeli blockade for years. There was no immediate comment from Israel on the Egyptian proposal. Washington warned its Israeli ally Monday against any ground invasion of Gaza, as Egyptian officials said the US top diplomat was headed to the region to join efforts to end a week of deadly violence. The White House stopped short of criticizing Israel over the civilian casualty toll from its devastating air and artillery bombardment of the densely populated Palestinian enclave that has drawn flak from the United Nations and human rights watchdogs. It said the Israeli government had the "right" and "responsibility" to defend its citizens against rocket attacks by Hamas from its Gaza stronghold. But it said even more civilians would be put at risk were Israeli Prime Minister Benjamin Netanyahu to heed hardliners in his governing coalition and send in troops and armor. "Nobody wants to see a ground invasion because that would put more civilians at risk," White House spokesman Josh Earnest said. It was the first time that the White House has specifically warned in a public forum against an Israeli invasion of Gaza, although other US officials, including Secretary of State John Kerry, have previously said Washington would not like to see such a step. With Israel's punishing air campaign in its seventh day, the death toll in Gaza hit 177, prompting growing calls for a ceasefire which have so far showed little sign of progress. Ahead of an emergency meeting of Arab foreign ministers in Cairo, Hamas shot down hopes of a deal to end the violence, saying no serious moves had been made. "Talk of a ceasefire requires real and serious efforts, which we haven't seen so far," Hamas MP Mushir al-Masri told AFP in Gaza City. "Any ceasefire must be based on the conditions we have outlined. Nothing less than that will be accepted," he said, in a show of defiance in the face of the withering Israeli bombardment. Israel has said it is not ready to countenance a ceasefire either, as it seeks to deal ever harsher blows to Hamas and stamp out its capacity to fire rockets deep into Israel. In a bid to add Washington's weight to truce efforts, Kerry is to fly into Cairo on Tuesday, Egyptian state media reported. There was no immediate comment from the State Department, with Israeli press reports suggesting Kerry would also visit Jerusalem and the West Bank city of Ramallah, headquarters of President Mahmoud Abbas. In Gaza City's Tel al-Hawa neighbourhood, relatives of a retired economics professor in his 80s looked at the damage to his home, clearly bemused as to why it should have been targeted by an Israeli missile. This time, the family escaped unharmed, fleeing after an initial warning strike. But the missile itself failed to explode, drawing a crowd of curious onlookers as officials wondered how to remove it. Human rights groups say more than 75 percent of the dead have been non-combatants. The UN agency for Palestinian refugees says more than a quarter of them have been children. Although Israel has confirmed preparations for a possible ground attack, it appeared to be holding off with the security cabinet meeting reportedly deciding against putting boots on the ground -- for now. But the pace of the air strikes slowed noticeably on Monday. 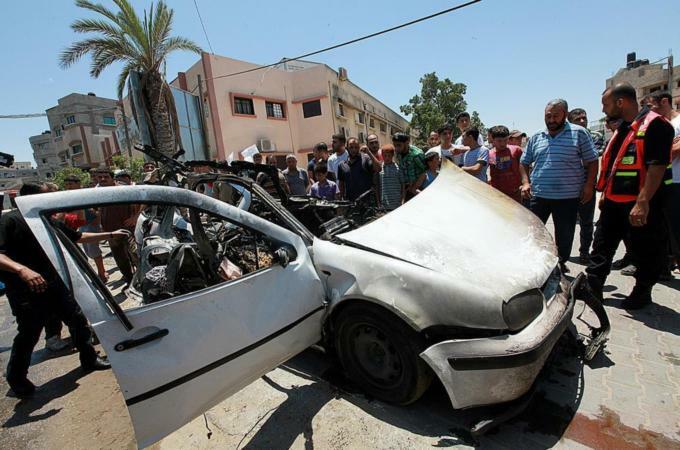 Seven people were killed, far fewer than the 56 killed on Saturday, the bloodiest day by far of a campaign which began before dawn on July 8 with the aim of halting militant rocket fire on southern Israel. So far, no Israelis have been killed. A handful have been seriously wounded. The rocket fire has since intensified, with Hamas militants launching more than 800 rockets at cities across Israel, including Jerusalem, Tel Aviv and the northern city of Hadera. A further 187 have been shot down. "The military steps being taken by both sides in the last 24 hours were a function, among other things, of the developments in the dialogue," Alex Fishman wrote in the top-selling Yedioth Aharonoth newspaper. "If no catastrophe takes place that causes a particularly high number of fatalities on either side, the likelihood is that the fire will abate as early as this week." As the human scale of the tragedy grew, a senior military official said the army was using a "pain map," hitting targets seen as most valuable to the Islamist movement. So far, Hamas does not appear in any mood for concessions. Masri said its conditions would include a lifting of Israel's eight-year blockade on Gaza, the opening of its Rafah border crossing with Egypt, and the release of prisoners Israel rearrested after freeing them in exchange for kidnapped Israeli soldier Gilad Shalit in 2011. Speaking to AFP in Cairo, another Hamas official said a general framework had been presented, but the leadership wanted more than it gained in a previous truce which ended the last major round of violence with Israel. "We need to build on the 2012 truce and move forward," he said. 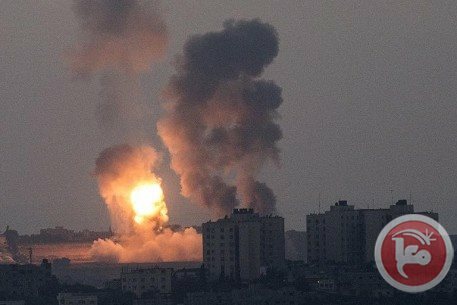 Three people were killed and seven injured including some critically after an Israeli airstrike on the Sheikh al-Eid family home in northern Rafah, residents said. 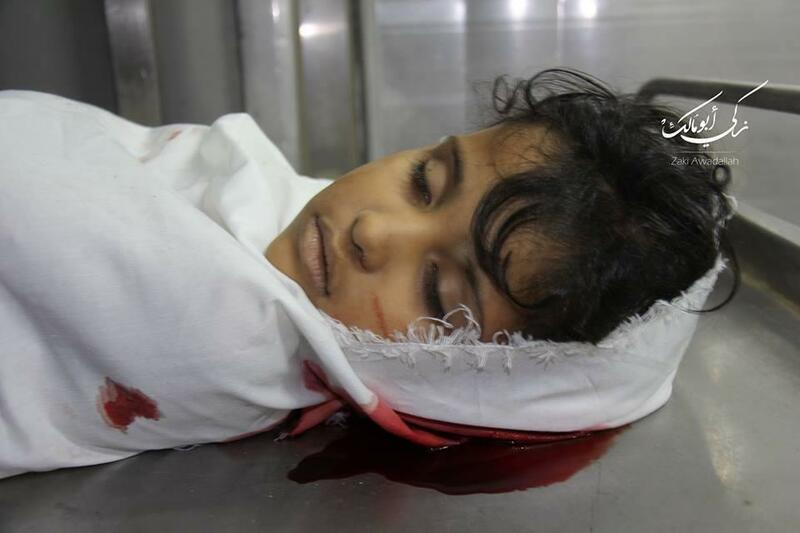 Sarah Omar Sheikh al-Eid, 4, Khalid Ahmad Sheikh al-Eid, 50, and Omar Ahmad Sheikh al-Eid, 24 were killed, witnesses said. An airstrike on the Abu Issa family home in Deir al-Balah injured six people late Monday, medics said. 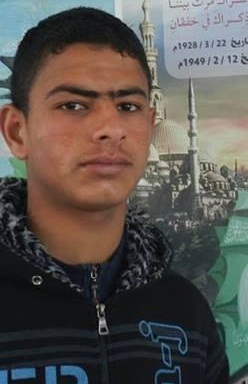 A Palestinian teenager identified as Ziyad al-Najjar, 16, died Monday after an Israeli airstrike on his motorbike in the southern Gaza city of Khan Younis, medics said. 'Israel' Defense Prize winner and aerospace engineering expert Dr. Moti Shefer told Radio 103 in an interview last Thursday that that Iron Dome was one of the biggest bluffs ever seen. Palestinian rockets, though defenseless, are believed to be a desparate means used by the resistance movements in Gaza to respond to the Israeli aggression. So far, mainstream Israeli media have reported no fatal casualties caused by the home-made rockets, however, the harm they seem to be inflicting on the colonial settler community is a dozen cases of mild injury and panic. Latest figures on the Palestinian side after eight days of offensive show that 175 Palestinians, with 40% of them are women and children, have been killed, and some 1150 injured so far. The rising death toll among the besieged Gaza community has been the result of Israeli forces intensifying air raids on populated homes, as 245 civilian houses have been bombed and completely or semi-completely destroyed until the moment, the latest of which was a house for Al-Hadidi family in the Al-Shate' refugee camp, west of Gaza City. Quoted by Globes, an Israel business news website, he said, "There is no missile in the world today able to intercept missiles or rockets. Iron Dome is a sound and light show that is intercepting only Israeli public opinion, and itself, of course. Actually, all the explosions you see in the sky are self explosions. No Iron Dome missile has ever collided with a single rocket. Open spaces are a myth invented in order to up Iron Dome's current interception percentages. The rockets announced as intercepted by Iron Dome either never reach the ground, or are virtual rockets invented and destroyed on the Iron Dom control computer. To this day, no one has ever seen an intercepted rocket fall to the ground." He continued, "What lands here is what's launched. The parts we see on the ground are from Iron Dome itself. We're shooting at ourselves, mainly virtually. The virtual rocket was invented in order to increase the vagueness surrounding Iron Dome. Assume that a real rocket arrives. What does the command and control system do? It creates nine more virtual rockets, and transmits their paths on computer graphics to the rocket launcher operators. The launcher operators see 10 rockets and launch 10 Iron Dome interceptors. People hear 10 booms, one rocket enters, and you get a 90% success rate." 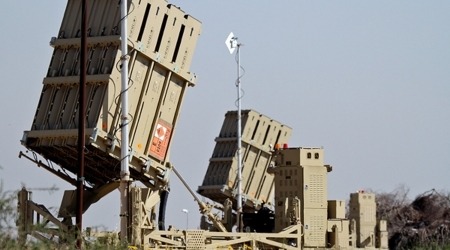 According to Dr. Shefer, Iron Dome is a part of a broad conspiracy, in which two interested parties afraid of peace are participating: the defense industries and Prime Minister Benjamin Netanyahu. Brigadier General (res.) Daniel Gold, who initiated Iron Dome, responded scornfully: "I won't make personal remarks here. Let him believe what he wants to believe. Anyone can see what the truth is here. All the interceptions to date are recorded and documented. We're the startup nation because of things like this, and this is much bigger than a startup. They put 300-400 of the most talented people here, who worked like crazy, with determination. It works." Dr. Shefer's ideas for developing interception systems were universally rejected before Iron Dome was developed. Beginnings matter. Questions about culpability and responsibility, about the narrow cynicism that defines so much of life in the Gaza Strip, sequence and motive - they all go to beginnings. Why are Israeli men and women battering and gnashing lives and livelihoods in that prison camp? How did it start? Why are they killing? What are they after? How will it end? The answers are embedded in our crusty beginnings. In the beginning, Zionists invaded Palestine. They expelled the Palestinians and Gaza, an ancient place that hosted Ramses II, Alexander the Great, and Salahuddin, became a tent city. A wasteland for the dejected and destitute. It didn't take long for Palestinians in Gaza to begin to fight to reclaim their homes from the Ashkenazis that displaced them. The Fedayeen - refugee militiamen - commenced with overnight raids as soon as the shock of their ignominious defeat began to wear. The first Israeli massacre in Gaza occurred in 1956. My father was a small boy at the time, but he remembers how the men were rounded up and shot. Today, his grand-nephews and -nieces, also refugees, also born in camps, cower in terror as the third generation of Ashkenazis in Palestine shows them their place. Life in the shadows, balanced precariously on obsidian with fire on either side - that's their inheritance. Among Israeli elites, Gaza is everything to everyone. 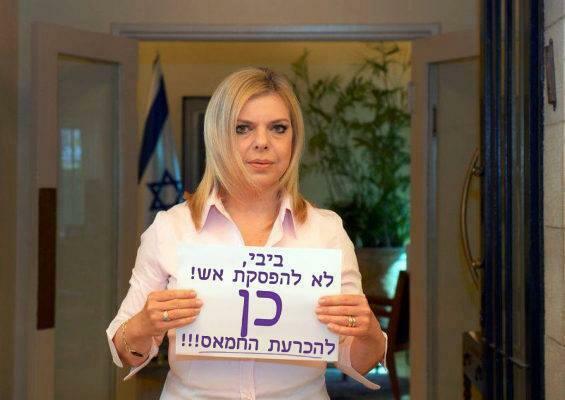 Israeli politicians attack Gaza to enhance their electoral appeal. They use it to muzzle the opposition, to preserve a coalition or to distract from a domestic scandal. Israeli generals like to invade to provide troops with "battle" training or to test new wares, and to debut new formations and tactics; Hamas is not Hezbollah, after all. Jewish-Israeli scientists, meanwhile, coordinate with the army to use the territory as a convenient testing ground for advanced, experimental technologies. Corporate Israel later repackages those technologies for global export. Those are the relationships - the status quo.The recent move towards Palestinian reconciliation undertaken by the Hamas and PLO leaderships, threatened to end the political - if not material - isolation of Gaza. It posed a risk to the current state of things by providing Hamas, a political movement which came to power through elections, with a means for re-entering the realm of international legitimacy. Once the Americans and Europeans agreed to recognise the new caretaker government, Israeli Prime Minister Benjamin Netanyahu began to seek a way out of his new, uncomfortable isolation. He could not attack the Palestinians solely for their political reconciliation - the Americans would admonish him for that. Nor, to his great consternation, could he convince world powers to repeal their endorsement of the new government. Desperately, he sought a way out. It came in the form of tragedy. When the three Jewish-Israeli settler teenagers disappeared in the West Bank, the Israeli leadership claimed that they were still alive. Through its prerogative as the enforcement vehicle of Israeli apartheid, the army spent three weeks smashing into hundreds of homes and terrorising their occupants in the search for the three youths. More than 500 Palestinian men were rounded up and imprisoned as Netanyahu clamoured for the teenagers' return and inveighed against Hamas, the group he claimed kidnapped the youths. No evidence was offered. Only bluster, bombast, and fatalistic conviction delivered in a sonorous tone of voice. As Max Blumenthal has documented, it was all a shameful and cynical political show. The Israeli leadership knew within the first day of their disappearance that the youths were dead; bullet holes, blood samples and a telephone recording provided evidence of what happened. But the ever-receptive Jewish-Israeli public demanded revenge and by the time the extent of the sham was revealed, the Israelis had killed nine people in the West Bank and three more in the Gaza Strip through missiles they fired in "retaliation" for the West Bank murders. Naturally, the Palestinians availed themselves of their right to self-defence. They used crude, unguided workshop missiles to reclaim the balance of fear that existed - thereby providing the Israeli leadership with more material for international consumption. It is now claimed that the Israeli bombardment of the Gaza ghetto had nothing to do with the murders of the three Jewish-Israeli youths. Instead, Israel is merely "responding" to Hamas' nihilistic provocations.More than a month after the reconciliation, it appears that Netanyahu has succeeded - his balance has been restored. Israelis are free to indulge in a grand delusion of self-righteousness. "No normal country could tolerate terrorists firing missiles into its urban centres," they say. "No normal country practises the crime of apartheid." or seeks vengeance and vengeance and vengeance in a fit of bloody wrath," we might wearily reply.